- Election of the President of the Parliamentary Assembly of the Council of Europe, Mr Michel NICOLETTI (SOC, Italy). - Speech by HRH The Crown Princess of Denmark. - Speech by the Prime Minister of Denmark, Lars Lokke RASMUSSEN. - Speech by Alexander VAN DER BELLEN, President of Austria. 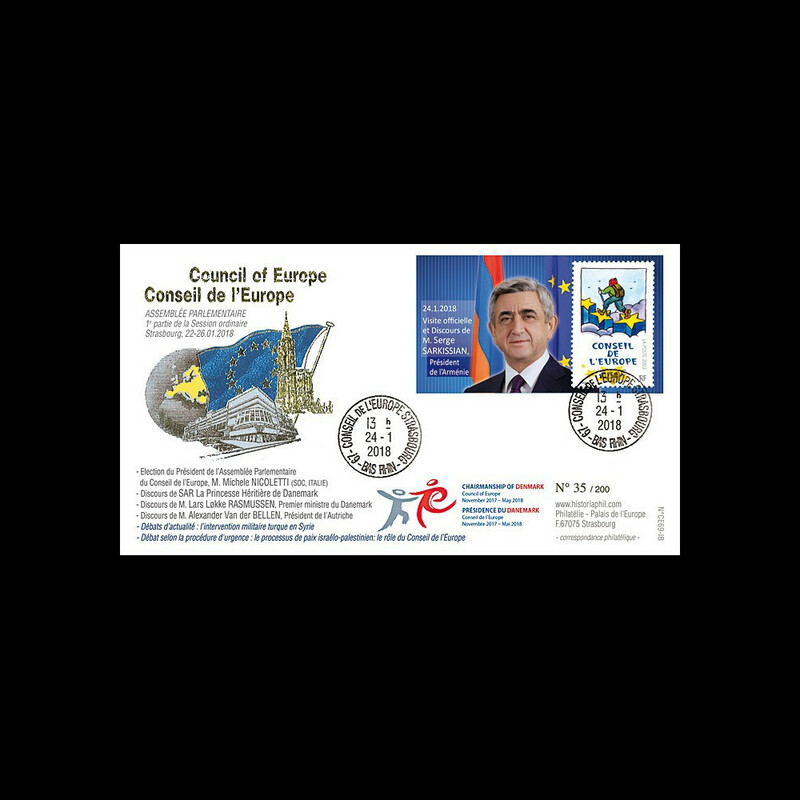 Franked France 1 value 0,50€ Council of Europe 2003 "Walker on the Stars"
CE64-IIIAPT1/5 : 06-2013 - Set 5 Marianne "Presidency of Armenia - Mr. NALBANDIAN"
CE64-IVA : 10-2013 - FDC Council of Europe "Visit Mr. SARGSYAN, Président Armenia"
CE64-IIIA : 06-2013 - FDC Council of Europe "Presidency of Armenia - Mr. NALBANDIAN"
CE64-IVAPT1/5 : 2013 - Set 5 Marianne "Visit Mr. SARGSYAN, Président Armenia"